Decreasing the exposure removes one exposure from a selected cell and pulls any cells following it to the beginning of selection. You can do this for one cell or a range. At the bottom-right corner of the Xsheet view, set the number of cells over which the drawing will be exposed. In the Xsheet toolbar, click the Decrease Exposure button. Right-click and select Exposure > Decrease Exposure. From the top menu, select Animation > Cell > Decrease Exposure. 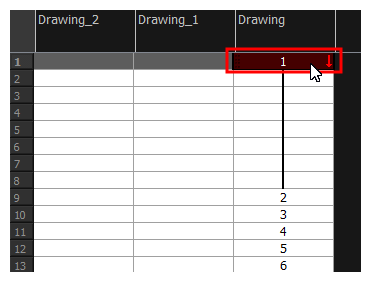 In the Timeline or Xsheet view, select a range of cells. From the top menu, select Animation > Cell > Clear Exposure and Pull. Right-click and select Exposure > Clear Exposure and Pull. In the Xsheet toolbar, click the Clear Exposure and Pull button. The exposure is reduced by the selected number of cells.